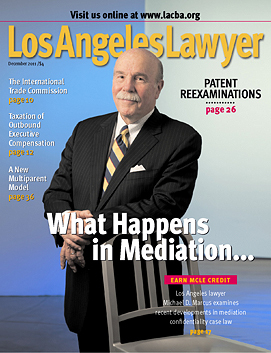 Marcus Mediation – Page 57 – Judge Michael Marcus (Ret. ), brings an extraordinarily broad legal background and experience to mediations and arbitrations. Judge Michael D. Marcus (Ret.) is a top-rated mediator, arbitrator and discovery referee, who is associated exclusively with ADR Services, Inc. Judge Marcus has been a full-time neutral since January 2002. If you are considering mediation, arbitration or discovery reference as a way of resolving a legal problem, please consider Michael Marcus who brings an extraordinarily broad legal background, experience and understanding to these important processes. Judge Michael Marcus (Ret. ), who received his B.A. from the University of California at Berkeley in 1964 and his J.D. in 1967 from the UCLA School of Law, brings an extraordinarily broad legal background and experience to mediations, arbitrations and discovery reference. Before becoming a full-time neutral in January 2002 with ADR Services, Inc., he was a very successful trial lawyer, a former law firm partner and a judge. He has also taught at law schools, is a legal author and a bar leader.